Do people take preservation of modernist structures seriously? They do in San Francisco, where the town's Planning Commission recently ordered the owner of a Richard Neutra-designed home to rebuild it as it originally looked, after he tore it down illegally. Throughout the nation, architects, planners, and preservationists have watched as many buildings from the 1940s to the 1970s have come down. But as the mid-century modern resurgence has grown, so have concerns about significant and beautiful residential, commercial, and institutional buildings. Folks who might once have fought simply to save their modern neighborhoods often find themselves branching out to the wider world of modernism. All too often, significant examples of modern residential architecture have come tumbling down with no notice. In recent years, that happened to two California modernist gems: the Brentwood home of Los Angeles architect William Krisel in 2014; and, in that same year, the spectacular Atherton residence of mid-century modern developer Elmer Gavello, a home that was designed by homebuilder Joe Eichler's architects Anshen and Allen. With larger buildings, though, there is often more notice, and time to react. There have been victories, as supporters band together to protect threatened treasures. Some of the endangered buildings discussed here are sure to go. But others could be rescued—perhaps with your help. There are people who would simply never go bowling. Yet many of those people deeply mourn the closure of Covina Bowl in late 2017 and wonder whether it will ever reopen. It's that striking of an image on the land, a true treasure of the roadside, with a towering, 60-foot-tall freestanding sign and a triangular entry that is "reminiscent of the pyramids of ancient Egypt." The Covina's architects—Gordon Powers, Austin Daly, and Pat DeRosa—were bowling alley masters, having designed close to 50 in California. Among those, Covina was special. 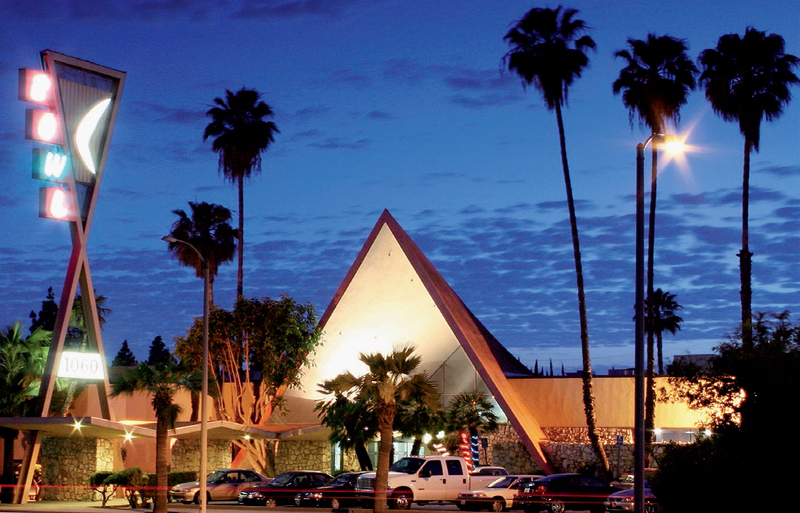 According to a 1962 article in National Bowlers Journal and Billiard Review, and who would know better, "Covina Bowl ultimately became the vanguard for the grandiose class of bowling center architecture which is still called, for want of a better label, 'California Style.'" The building was named to the National Register in 2016. A developer wants to build housing on the site. The Los Angeles Conservancy has been seeking a "win-win situation." "Covina Bowl's Googie elements," the Register nomination states, "include the auto-centric design, pyramidal entrance, prominent neon sign, exaggerated folded plate canopy-porte-cochere, natural rock piers and accent walls, and plate-glass windows that bring the landscaped outdoors in." After the original 19th century Stanford Quad, with its rusticated arcades, the most outstanding complex of buildings on campus has to be Stanford Medical Center. But it is slated to be demolished and replaced due to state seismic rules. Stanford argues that the center is "functionally deficient." Ed Stone, working with landscape architect Thomas Church, created a 56-acre complex with seven buildings that is both delirious and relaxing. His characteristic concrete screen blocks add romance. Rooms open onto a series of garden courtyards. Mary Anne Hunting, author of a monograph on the architect, called the center "a hospital of restful beauty with almost every part related to garden courts." In arguing to save the building by using it for other purposes, architectural critic Alan Hess said it was one of the best buildings by Stone, a leading mid-century architect with a style all his own. "It ranks alongside the 1958 American Embassy in New Delhi and the U.S. Pavilion for the 1958 Brussels Fair in expressing Stone's innovative, controversial, and highly popular interpretation of modern architecture," Hess wrote.